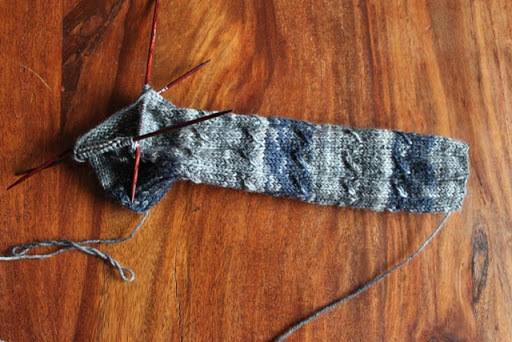 Progress has been made on my Right Twist Cable Rib Sock..now that name is to long so I have been thinking of a name to call these socks since I started them and the yarn itself reminds me of storms and how the sky would look during one so I’m going to call them Stormy Sky. I’m now working on the foot part so its moving along nicely, will they be done in time for Alan’s birthday no but hopefully not long after it. This entry was posted in Uncategorized and tagged Right Twist Cable Rib Socks, Sock KAL, Stormy Sky.. Bookmark the permalink. Perfect name, love the colours…I'm playing catch up today, so far behind with everything, and blogger/laptop/broadband are making things soooo painful! What an appropriate name Ruth. They also remind be of the sea in a storm. Love the yarn color and I love your name for it. You're doing beautifully. My socks just have a little cuff and it's still taking me forever. It sounds like everyone's been busy lately…I know I have been too! Keep up the good work! Yu're doing so well now, Ruth! Remember how sock knitting seemed a bit daunting? Now you've conquered this area!